In the world of gaming, four years is a long time. In the specific corner of the hobby that is mobile gaming, four years might as well be twenty. It’s long enough to turn the greatest of apps into digital dust, to add 1200 levels to Candy Crush Saga (Free), to see a new iPhone model launch and be discontinued, and certainly long enough for a diligent developer to turn around a disappointing launch release. 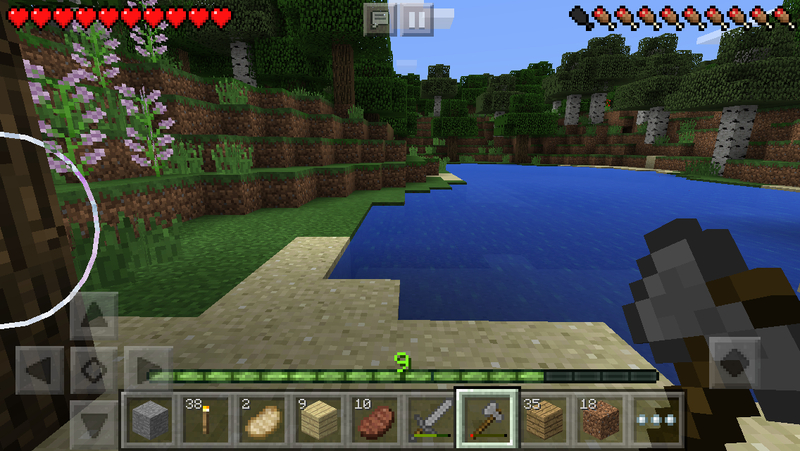 Minecraft – Pocket Edition ($6.99) was a shell of its proper self when it debuted on the App Store back in November 2011, something we made note of in our original review. And while I don’t want people to get in the habit of expecting a new review for every game that gets a significant update or two, Minecraft – Pocket Edition has come so far that almost nothing in our original review applies to the game anymore. With the release of a significant new version of the game, now is as good a time as any to revisit it. I’m not going to waste many words talking about what Minecraft is and where it came from. There are entire bookshelves dedicated to that. It’s digital LEGO in an open world with gentle RPG and action elements, and it’s probably the most significant game released in the last 25 or so years. When it initially released on mobile in late 2011, the only other platforms it existed on were the various home computers. It’s now available on pretty much any gaming hardware that doesn’t have a Nintendo logo on it. Given the relatively weak tech the Pocket Edition was developed in mind for, it’s no surprise that it was missing things from the original version. There were a lot of missing features that didn’t seem quite so connected to the under-powered hardware, though, lending the game the feel of an early access alpha. Well, Minecraft basically invented that, so all’s fair, I suppose. In 2015, however, the technology inside mobile devices has come a long way, and with four years behind them, Mojang has had a lot more time to work on fleshing out the game. Where we once had a game with a small world, no monsters, no night, no mines, and no crafting, we now have an infinitely expanding world, a robust cast of creatures, sunsets and starry nights, plenty of underground caves to go spelunking in, and a healthy, if not complete, crafting system. There are still a few crucial pieces missing that make the game feel more limited than the PC version, particularly the ability to use redstone for electrical devices and freely switch between creative and survival modes in-game, but we’re nearly at the point of only having nits to pick. The original Minecraft – Pocket Edition had virtually none of the things that make Minecraft so special, and as a result, it felt nothing like the game beyond the thinnest of surface layers. The current version might not have everything, but it certainly hits all the notes a port of Minecraft should. Exactly what those notes are is up to the individual player. That’s always been the strength of Minecraft. If you just want to chill out and build a life-sized replica of the local Taco Bell, you can do that. If you like the mystery and thrill of exploring deep caves with limited resources, go for it. Maybe you’d like to power up your character, forge strong equipment, and face off against monsters? Or perhaps you’d like to travel the world, living off the land and building little shelters as you go. You could create a farm, a giant dream mansion, a massive tower, your own monster-filled dungeon, or the world’s largest wang. There are limitations in Minecraft, and a few more in the mobile version than in the computer versions, but the main boundaries for most players are going to be set by their own imagination. The way the game rolls out, it’s also pretty hard to put down. As long as you’ve got ideas, you’ve probably got some small thing you could do to progress on another project. And hey, if it’s not too big of a project, why not finish it right now? You’ll probably need more materials, though, so you’ll have to head down to a cave first and see what you can find. Look, you found more than you expected, and now you have some extra crafting materials. What can you do with this? Well, you could probably build another small thing, right? Hm, but you’re missing a certain type of wood. And so it goes, until your battery dies or your stomach informs you that you yourself are about to. Of course, it’s not the only game that offers this kind of experience on iOS, and it might not even be the best for your dollar. But it is the original, and it’s still in active development. Looking back at the last four years of progress, knowing it’s going to keep on going, I’m pretty excited for this game’s future. That wouldn’t be enough to recommend the game if it weren’t already extremely enjoyable and full of fun things to do, but I think it’s pretty safe to say at this point that even if Minecraft – Pocket Edition is still being eclipsed in some categories by particular other titles, it can at least hold its own and provide an embarrassing amount of fun. My only gripe with the latest version is with the new control layout. You can use an MFi controller if you have one, and that’s great, but the redesigned touch controls are improved in some situations and a lot worse in others. If you’re playing in creative mode, flying is a lot more troublesome than it used to be, for example. I hope Mojang adds the ability to choose between the new and classic controls in a future update, but we’ll have to see. Oh, and I’d still like to hear the PC version’s music in the Pocket Edition someday. But now we’re picking nits again, aren’t we? 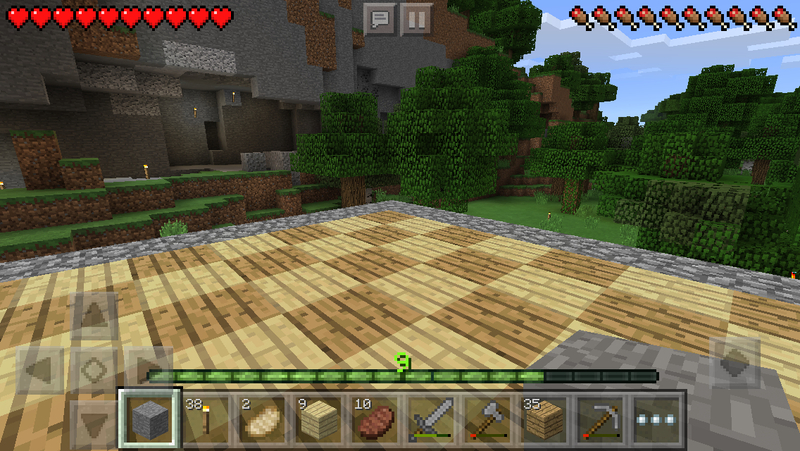 The bottom line is this: Minecraft – Pocket Edition might not be 100% of the way there yet, but it’s close enough to make it a solid recommendation for anyone looking to play Minecraft on the go. There are other great crafting games on iOS that have seen a lot of developer support such as Junk Jack X ($4.99), Survivalcraft ($3.99), and Terraria ($4.99), but you really can’t go wrong by adding Minecraft to your library. 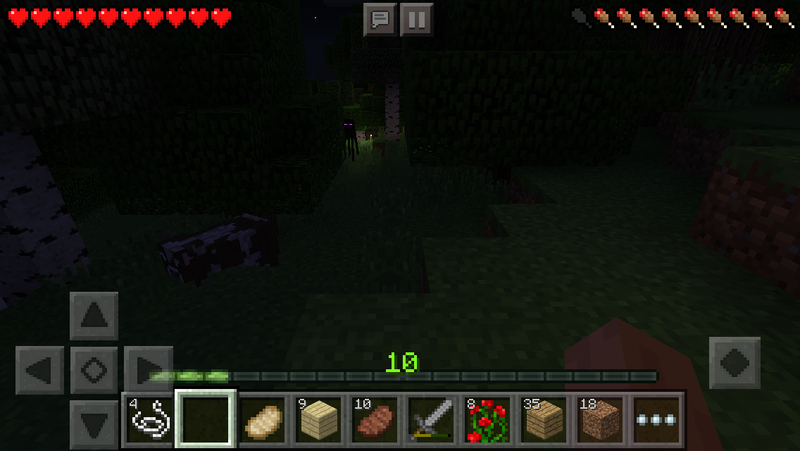 Way to go, Mojang. Now, about that redstone?